Ross control and data acquisition systems offer unprecedented accuracy and flexibility in the mixing and blending process. 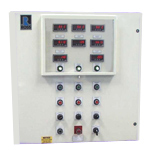 Our systems monitor an array of process parameters while they control essential mixing parameters as mixing time, speed, temperature and vacuum/pressure. Windows-based software allows manual or automatic operation, with simple cycle programming. Ross offers a variety of choices in control designs from simple relay-operated units to prefabricated pulpit-style PLC control rooms with graphical user interfaces. Ross Systems & Controls is a member of the NFPA. The company can also provide UL-listed systems for both hazardous and non-hazardous locations. Our goal is to build controls that are superior because they are an integral part of the process/machine manufacturing system. To request a brochure for the Control Systems, please completely fill out the following form. You will then have access to download the brochure in PDF format or to request that one be mailed to you.